This weekend is Thanksgiving here in Canada. We are having our turkey feast today and does the house ever smell good! Between some running around this morning and prep for dinner, we’ve not had too much time in the woodshop or sewing room today – although we have both gotten some creative work in between other tasks. And, to be fair, Stephen has been doing most of the work in the kitchen, as usual. He has baked bread and a pumpkin pie as well as cooked the turkey and prepped and cooked all the veggies and made fresh cranberry sauce. My contribution on that front has been mostly limited to encouraging words about how good it smells and looks. But, in my defence, I did do much of the advance work – I grew and pureed the pumpkin for the pie and the squash for the soup. I am not actually sure who made the batch of squash soup for tonight as we had both made and frozen batches but I’m probably grasping there. I also picked the wild cranberries for the sauce. 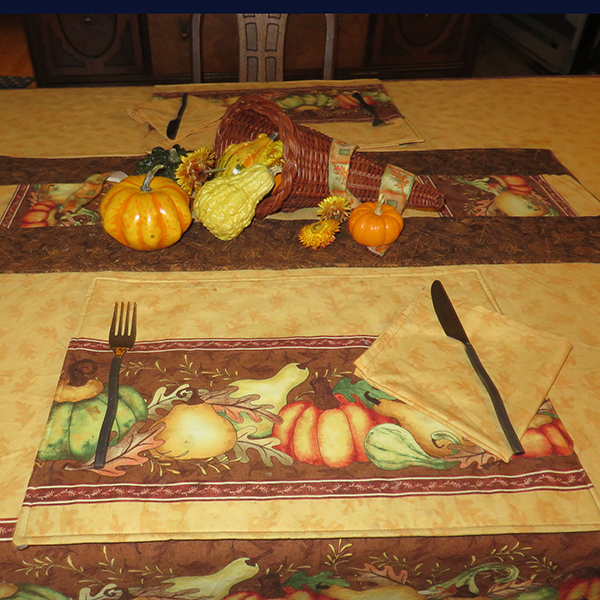 And I was responsible for setting the table and creating a fall feel so it really is a team effort. That is my story and I’m sticking too it. And that takes me to the holiday decor of this post. Today, I am sharing a project that I made previously but it is fitting for today. I used a fall border material. It is the first time that I tried those and it was fun to use. All I had to do was cut the material to size and hem. I used a half inch double hem. 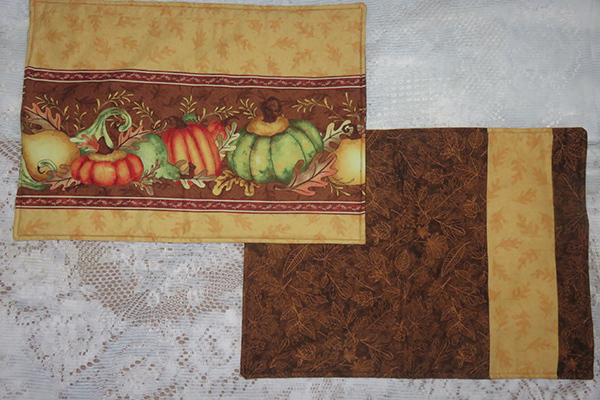 I bought some backing material and made a set of reversible place mats and a table runner for the center of the table, all of which incorporated the border print of the material. I quilted with a simple stippling so it finished quickly. The last piece was a set of napkins, which are fine though I should have made them bigger. They are only 15″ square and since those ones I have found that I prefer at least 18″. Using the matched pieces makes for a lovely table, I think. All I added was a cornucopia of small dried ghords for a fall look. 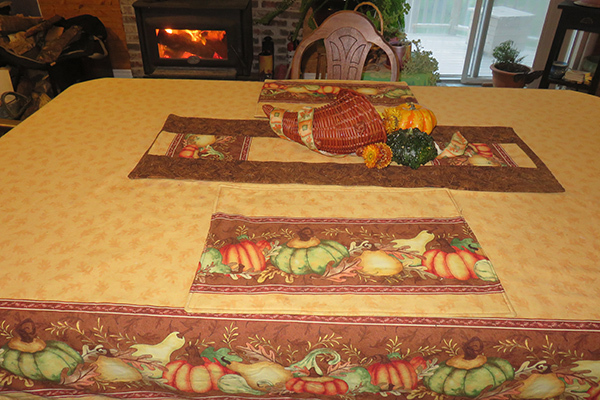 I highly recommend trying this type of border cloth for holiday season decor. I have picked up a couple of Christmas prints that will make beautiful gift sets. They would also make wonderful collections for a wedding shower gift. Do you decorate for various seasons of holidays? What are your holiday stand-by features? Share your holiday crafting ideas in the comments.